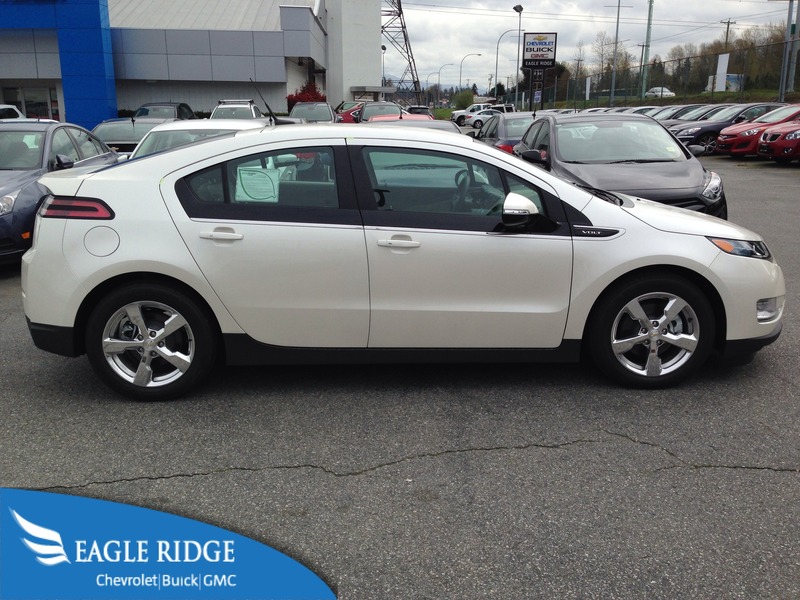 Eagle Ridge GM | Blog | What is the Chevrolet Volt? The Chevrolet Volt is designed to cut through the air, reducing drag. When the Chevrolet Volt hit showrooms in late 2010, it was a vehicle that was intriguing, refreshing, but most of all, confusing! It’s design signaled that it was not an ordinary car, and buyers were curious. Yet almost 4 years later, people continue to be unsure of exactly what the Volt is. This confusion prevents many potential buyers from considering the Volt, which is a shame as it is a really interesting and innovative car. Here in the lower mainland, we are currently paying around $149.9/liter for gas. An absurdly high price and one that could creep higher as summer arrives. Drivers are always seeking to lower their fuel costs and the Chevy Volt is an excellent way to do this. Here’s a summary of what the Volt is and why you should consider it. The Volt is not a hybrid (although some people classify it that way). The Volt is a purely electric vehicle that is aided by a gasoline powered engine which is used to power a range extending generator. This range extending generator replenishes the vehicle’s electric energy. While most hybrids (such as the Toyota Prius) receive power and propulsion from both the gasoline and electric components of the engine, the gasoline component of the Volt is range extending only and is not a main source of propulsion for the vehicle. When you drive the Volt from full charge, the vehicle will act under electric power. Once the plug-in battery drops past a predetermined threshold from full charge, the internal combustion engine powers a generator to extend your range. The Volt also has regenerative braking to restore battery power. Typically, the Volt will operate on battery power for the first 40 to 80 kilometers. With a full charge and full tank of gas, the Volt has a total range of roughly 611 kilometers. 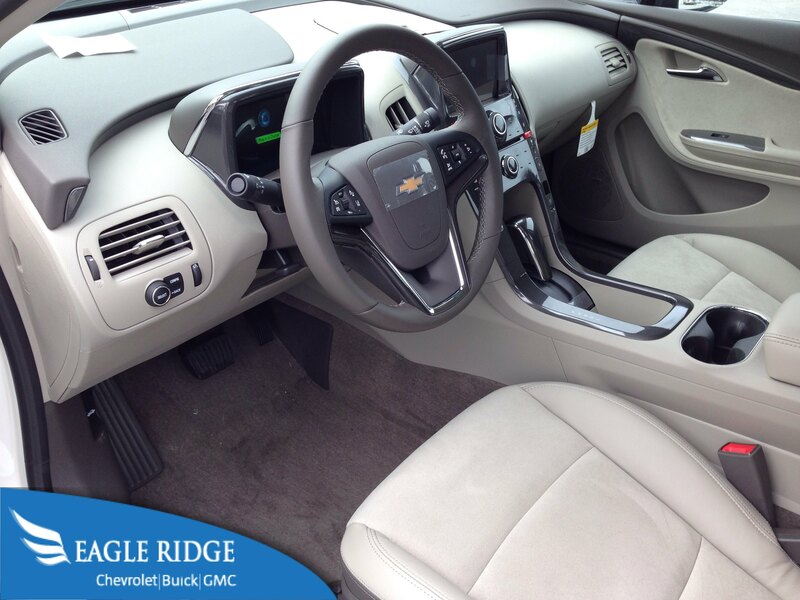 The Chevrolet Volt comes standard with 8 airbags. To recharge the Volt, you can use a 120V or 240V electrical hookup. The 120V charge will have the vehicle back to full power in 10 to 16 hours and the 240V will restore power in roughly 4 hours. Engine output works out to 111kW (or 149HP) with 273 ft-lb of torque. The gasoline component is a 1.4L 4 cylinder engine with 80HP. With four different driving modes (Normal, Sport, Mountain and Hold) you can tailor the characteristics of the vehicle for your driving conditions. Mountain, for example, will store extra power to assist in long climbs during mountain driving. 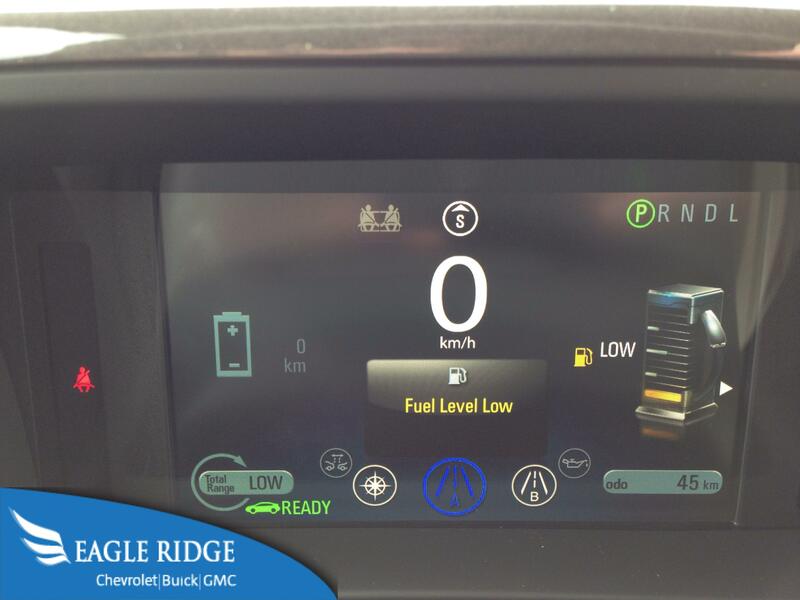 The innovative display in the Chevrolet Volt. The Volt has many advantages for commuters seeking relief from high gas prices. For drivers that travel between 40 and 80 kilometers round trip, the Volt will likely act solely on electric power, utilizing no gasoline. If you then recharge the vehicle overnight, you will be ready to go again in the morning. Even if you do travel more than that, the gasoline engine will replenish the battery power, costing you only slightly more. Overall, it is a dramatic savings when compared to a conventional gas powered car. 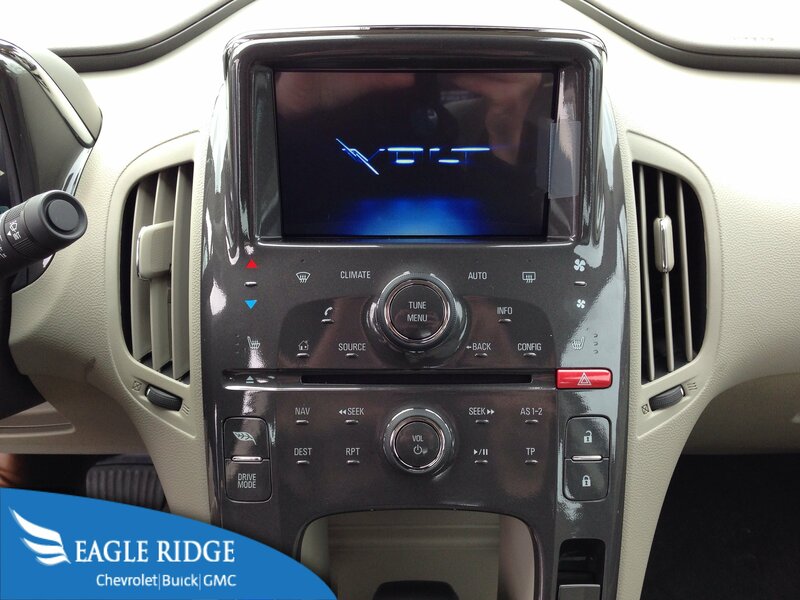 Infotainment and climate control system in the 2014 Chevy Volt. I invite you to come see the Volt for yourself. There are a lot of misconceptions about the car, how it drives, how it operates and what its benefits are. Despite being an electrically powered vehicle, it still has the necessary power for highway merging and can carry you through a mountain roadtrip. 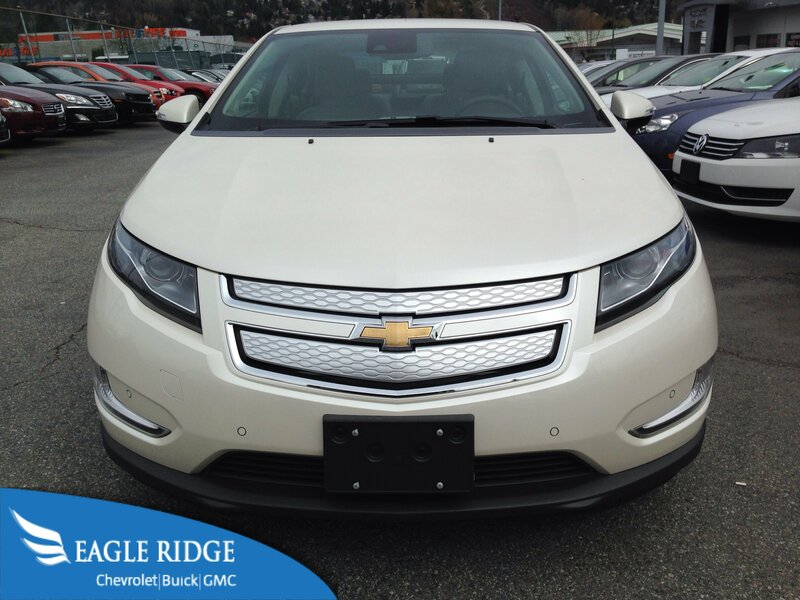 (At the time of posting, we currently have new and pre-owned Volt models on our lot). Comment below and let us know any other questions that you have about the Volt? What do you think of the car? is it something that you would consider? See our current Volt lineup here!